When Palm announced the Pre Plus and Pixi Plus were going to be exclusives to Verizon, a large number of Sprint users were utterly frustrated. While that's understandable, it's worth pointing out American users have, overall, had a much better webOS experience than the rest of the world. As they say, every so often, it's best to air the frustrations. Done not to put down, but rather put things in perspective and raise issues some might not know about. So with that in mind, let's take a little trip around the world. Being a Canadian, this part takes particular importance for me. Currently, by far, the biggest issue with the Palm Pre is the lack of paid apps. While the European App Catalog has been confirmed to get paid apps in March, there's been literally no word from Palm about Canadians getting paid apps. Very disappointing as that seems to imply Canadians will have to wait till after March, at the earliest. The second issue of large importance for Canadians, myself especially, is Palm's incredibly bad carrier choice. Avoiding the topic of carrier quality, the simple fact is Bell Mobility does not sell to all of Canada (not selling to 2 provinces and 3 territories). Worse yet, of the parts of Canada that Bell does sell to, there's been very little product promotion. Also related to Palm's choice of Bell as the Canadian carrier is app restrictions. Recently the developer of RadioTime encountered difficulty getting the freeware app working on Bell devices. Apparently Bell was blocking access to the internet radio servers due to some Terms of Usage restriction. Palm had to actually intervene and get Bell to allow access. A quick chat with a Telus representative informed me that Telus has no such restrictions. And then, of course, it's worth noting, there's yet to be any announcements of a Canadian Pixi, Pre Plus, or Pixi Plus, just rumours. Easily the number one complaint heard from European users is the language barrier. Sure, the webOS does include support for multiple languages, but alas, homebrew apps do not. Even worse, a very significant number of patches will not apply properly with non-English language devices. This is due to the webOS format for language localization. The second issue applies to Canadians as well, but is much more noticeable on Europeans devices: App Catalog region filtering. When developers submit an application, they are presented checkboxes of which countries they want the app to be available for. Unfortunately, a lot of times, developers may only choose USA or Canada, leaving the European far less populated. Thankfully, Europeans are getting paid apps in March. And don't forget about how webOS updates tend to be released later on the Europeans devices, delaying, sometimes critical, fixes. In addition, from what many Europeans have tweeted and posted in the forums, the advertising for the Palm Pre has been pretty minimal. And once again, there's been yet to be any announcements of a European Pixi, Pre Plus, or Pixi Plus. The newest international carrier has brought within it some frustrations of its own. 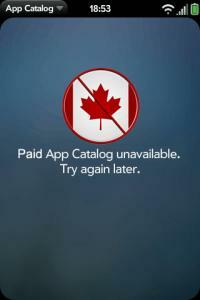 As with Canadian and European devices, there's reduced App Catalog apps available. And similar to French Canadians and non-English-speaking Europeans, there's this issue of patches not working correctly. However, by far, the biggest frustration of Telcel Pre users has got to be the webOS version. Introduced way back on November 27th, the Telcel Pre had webOS 1.2.5 (at a time when everyone else was enjoying webOS 1.3.1). The amazing thing is, Telcel users were stuck with webOS 1.3.5 all the way until January 8th, when they joined the rest of the world with webOS 1.3.5.1. Let's hope they can keep up to date from now on forward. And, like the Canada and Europe, no word on a Mexican Pixi, Pre Plus, or Pixi Plus. This is unfortunate, as Palm has had a good long relationship with the Asia Pacific. At least the unlocked German GSM Pre come unlocked, so if you're certain you want a Pre, there's that. Again, it should be stressed that all these frustrations are not listed as a large complaint letter to Palm, but rather a global perspective of various frustrations and annoyances. I'm as huge a fan of Palm as you'll ever find. They've come a very long way in a short time, especially for how small a copy they are. No doubt a year from now most issues will be solved; international growing pains are just that. All things in perspective, Verizon and its Pre Plus/Pixi Plus exclusivity isn't so bad, eh?